Li Bingbing (front), actress and UN Environment Programme Goodwill Ambassador, speaks during the opening ceremony of the Climate Summit at the UN headquarters in New York, on Sept. 23, 2014. The one-day summit, convened by UN Secretary-General Ban Ki-moon, is expected to galvanize global action on climate change. The United Nations General Assembly got a dose of star power last night, as American actor Leonardo Dicaprio and Chinese actress Li Bingbing laid the groundwork for a new global treaty to tackle climate change. UN ambassador on Climate Change DiCaprio addressed the delegates, urging leaders to make protecting the environment a priority. "Clean air and a liveable climate are inalienable human rights. And solving this crisis is not a question of politics, it is a question of our own survival. This is the most urgent of times and the most urgent of messages. The time to answer humankind's greatest challenge is now. We beg of you to face it with courage and honesty." 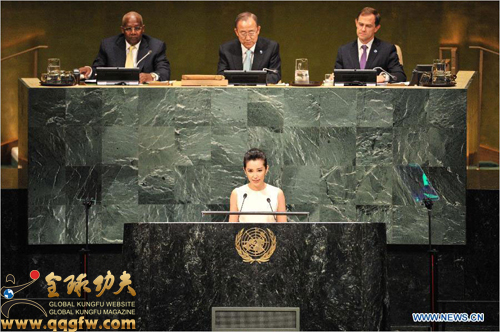 Chinese actress Li Bingbing also addressed the summit's opening ceremony. "I remain optimistic that this climate summit will be about action and solutions as we pursue our common goals of a low carbon economy. We have an expression in Chinese. This means, "Where there's a will, there's a way." Bingbing and Dicaprio are not the only stars at this years summit. Actress Emma Watson addressed the UN on Saturday in order to bring attention to the issue of gender equality. Other messengers who have advised the world body on a variety of issues include actors Michael Douglas and Charlize Theron, and author and Holocaust survivor Elie Wiesel.